This leisurely cruise follows the Chindwin River through rugged and dramatic scenery, stopping at rural villages and remote monasteries. Discover a Myanmar few have experienced. The small ship Orcaella, with just 50 passengers, can navigate Myanmar’s little-known Chindwin River, site of a remote monastery with carved Buddha. No reviews yet for this trip. Browse other reviews below for Belmond . Arrive in Mandalay and enjoy a sightseeing transfer to the ship. You’ll see the revered Mahamuni Temple, Kyaukisittan and Shwe Kyaung before arriving. Once on board a buffet lunch will be served as we sail past the golden temples of Sagaing, followed by a welcome briefing and afternoon tea in the Lounge Bar. Join us in the Restaurant for a welcome cocktail before dinner. This morning enjoy an introductory lecture about the Myanmar way of life as we cruise towards Monywa. Later visit the colourful Thanboddhay Pagoda at Monywa. Complete the tour with a photo opportunity at the magnificent 424ft standing Buddha at Bodhi Tataung. After breakfast alight for a walking tour of the traditional farming village of Moktaw. Witness an important rite of passage in Myanmar, the novice initiation ceremony, at the Moktaw monastery. Spend a leisurely afternoon on board before a longyi cocktail party and after dinner entertainment. Disembark for an early morning visit to the ‘Teak Port’ of Maukkadaw before returning to the ship for brunch. This afternoon take afternoon tea in the Lounge while Dr. Khin Maung Nyunt treats you to a local history lecture. Dinner is followed by Toh dances on the Sundeck. After breakfast take an excursion to Kalay for a glimpse of local life at the lively market. Relax and enjoy the ship’s luxurious facilities this afternoon as we cruise towards Mawleik. Dinner this evening is a barbecue on shore at Mawleik, with transfers by local tuk tuk. This morning visit Mawleik town, once the adminstrative seat of the Bombay Burma Trading Company. Take a local truck transfer to Mawleik elephant camp followed by a historical tour of the town. Enjoy lunch and afternoon tea on board. This afternoon your guide will present a lecture on the current situation in Myanmar. Dinner is followed by the release of Shan balloons. Belmond Orcaella docks tonight at Sitthaung. Disembark for a morning trek to the rural village of Sitthaung. See the emerald green paddy fields on your way to the village pagoda. After lunch on board the ship enjoy the views as we sail towards Naung San Kyin, or participate in the discussion of Myanmar religions, culture and traditions in the Lounge. Today’s excursion takes us to Homalin town. Enjoy a riverside walk, the morning market and the Buddha Lotus Garden with its exquisite temple and stunning views. Spend the afternoon at leisure as we sail to Nan Maw Leik. Enjoy a leisurely breakfast as we sail through beautiful scenery towards Kyidaung. This morning watch Belmond Orcaella’s Executive Chef deliver a cooking demonstration on the sundeck. In the afternoon join a walking tour to the quaint village of Kyidaung and visit the Oo monastery. 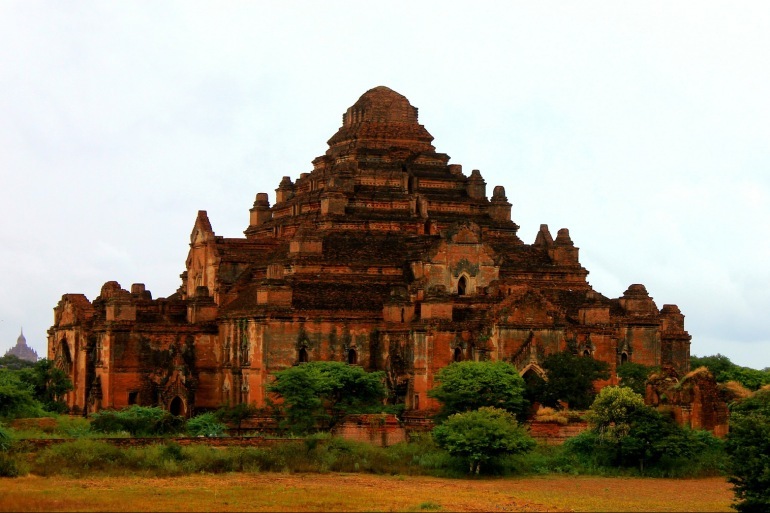 Take a morning tour of Mingin, an important town during the reign of King Mindon, including a visit to the impressive Mahar Minkyaung Monastery. Return to the ship and continue towards Kani for an afternoon tour. Visit the site of the Nat Shrine and experience a real 'Nat Pwe' paying homage to the Nat of Kani. Enjoy a mid-morning brunch before disembarking for a visit to the exceptional and historically important sites of Bagan, accompanied by our guides. After breakfast transfer to shore to experience the morning market of Nyaung Oo followed by a tour of Bagan’s major temples. Lunch is taken on shore in a Bagan restaurant. This afternoon there is a choice of activities. Travel to sacred Mount Popa, stopping off at a Toddy Palm plantation on the way, or take a private horse and cart or bicycle tour within the city of Bagan. Enjoy the evening’s farewell cocktail party and entertainment before your final dinner on board. Disembark early morning for your return flight to Yangon and onward travel.